Secretary of Health and Human Services Alex Azar announced one billion dollars in grants Wednesday to help combat the opioid epidemic across the country, adding to major federal actions on opioids throughout the past week. Disbursed through state-level programs, $900 million will be used to support medication-assisted treatment with methadone, buprenorphine, and vivitrol, all drugs which curb opioid cravings. The funds will also be used to provide prevention, treatment, and recovery activities aimed at opioid use disorder. An additional $400 million will be disbursed to help community health centers, schools, and rural organizations expand their opioid abuse treatment programs. $150 million will come from the CDC, focused on improving knowledge of the epidemic through more timely delivery of local-level public health data. "HHS is taking a number of new, unprecedented steps to empower local communities in their fight," Azar wrote in a USA Today op-ed. "These are part of HHS's comprehensive strategy for the crisis, which is grounded in the best science and evidence we have." The funds will be awarded on the basis of a formula, with fifteen percent set aside for the ten states—mostly in Appalachia and New England—with the highest drug overdose death mortality rates. According to a statement from Azar, HHS believes that it has made "progress" on curbing the opioid crisis. HHS noted that the recently-released National Survey on Drug Use and Health showed that in 2017 fewer Americans initiated heroin use and abused opioids than the preceding year. The department pointed to this as a sign that its initiatives to combat the epidemic are working. The full picture from the NSDUH is not quite so rosy. 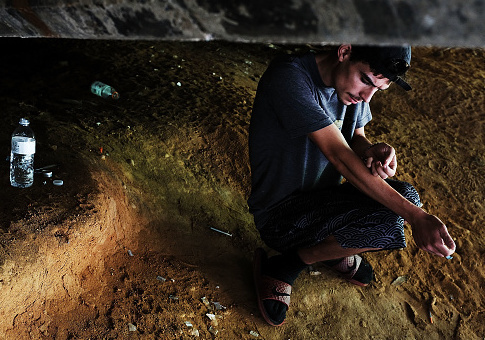 The number of self-reported heroin users over the age of 12 fell slightly, but only to approximately the same level as it was in 2012, 2013, 2014, and 2015 – all years in which the heroin death rate rose steadily. Rates of heroin use among 18 to 25-year-olds, the most at-risk group, fell to 2010 levels, which are still elevated as compared to pre-crisis. The full picture of opioid overdose deaths is more complicated. The rates of increase in heroin and prescription opioid overdose death slowed in 2017, signaling some possible success. However, the total number of drug overdose deaths has continued to rise. That is because the underlying cause of opioid-related deaths has shifted over the past several years. The overwhelming driver of overdose death in 2017 was fentanyl, a hyper-potent synthetic opioid which is often used to adulterate other drugs, including but not limited to heroin. As such, even if heroin and prescription opioid abuse are declining, the deadliness of each drug is on average increasing, meaning that abated consumption does not necessarily translate into an abated death epidemic. The continued surge in drug overdose deaths in 2017 has finally prompted congressional action. The Senate on Monday passed its version of a multi-bill relief package for the opioid crisis. The Opioid Crisis Response Act of 2018 (OCRA) provides funding for federal agencies to set up and expand treatment and recovery programs, NBC News reports. Central to the seventy-bill package is Sen. Rob Portman’s (R., Ohio) Synthetics Trafficking and Overdose Prevention (STOP) Act. The proposal would require the U.S. Postal Service to collect electronic information on shipments from overseas, a reform that might help curb the flow of fentanyl flowing into the United States from China through the U.S. mail. "This comprehensive opioids package is designed to help turn the tide of this epidemic, and I’m pleased the Senate passed it in an overwhelmingly bipartisan fashion," Portman said. "We need to help more people get longer-term treatment to overcome the disease of addiction, and we need to do more to keep deadly fentanyl out of our communities. This legislation will do both." This entry was posted in Issues and tagged Government Spending, Opioids, Trump Administration. Bookmark the permalink.